Discover Bali's unique cultural heritage and scenic natural surroundings on this full-day tour. Witness the entertaining, mythological Barong dance, explore traditional artisan villages, and marvel at the majestic volcanic mountain of Batur. You will be picked up from your hotel, sit back, and relax as you journey through the Balinese countryside. Stop at Batubulan Village, famed for its stone statues and sculptures. 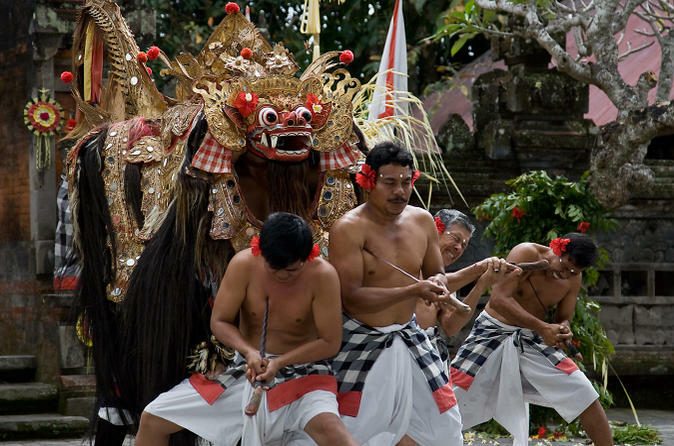 While there, watch the lively Barong dance, a piece of Balinese mythology with ornate costumes, traditional dancing, and unique musical instruments. Then drive on to Mas, a well-known woodcarving village. See the intricate carvings of handmade wood products, interact with the friendly villagers, and watch how artisans transform a simple piece of wood into fine art. Next, stop by the UNESCO cultural site of Goa Gajah (Elephant Cave) and wonder at the detailed sculptures of mythological creatures carved into the cave entrance. Continue to Kintamani and be fascinated by the lush panoramic views of Mount Batur - an active volcanic site—and its surroundings. Stop at Ubud, Bali's preeminent center for fine arts, dance, and music, and get a glimpse of Bali's cultural heritage. Before heading back to your hotel, stroll through Celuk, famed for its beautiful gold and silver ornaments. Don't miss the opportunity to purchase stunning handmade bracelets, rings, necklaces, and many other glimmering mementos.